This project required a recyclable packaging system that would replace the expensive foam separators that were currently being used. The automotive parts being shipped are finish painted.and must be supported with an even low surface pressure. The solution was three layers of 20 parts in standard 7" x 13" x 22" tote boxes. Each layer was held with 2 separator strips formed to the profile of the parts using 0.030" thick HIPS (high impact poly- styrene). Each strip used only 1 oz of plastic. The automotive parts that are being shipped. 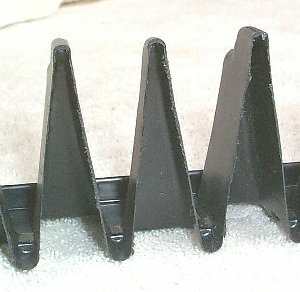 Their size is 2" x 12.5", made of steel and weighing 0.6 lbs. each. 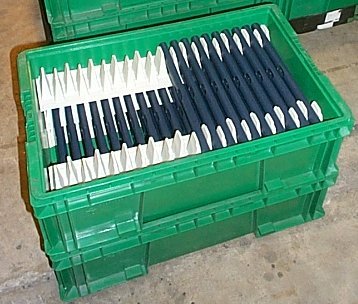 This shows how the parts are supported inside the shipping tote box. Only 7 parts were loaded for clarity. 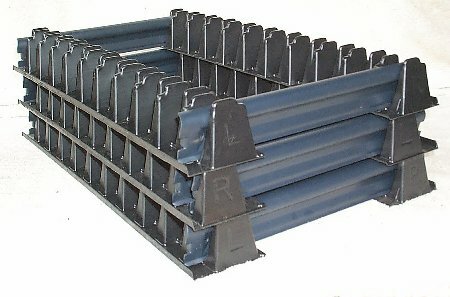 Here's a section through the dunnage showing the plastic thickness and profile.